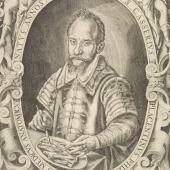 The Fabrica included a portrait of Vesalius as well as his anatomical subjects. 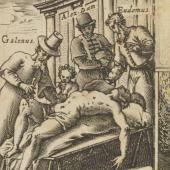 Traditionally, physicians were portrayed by their tasks, such as visiting patients at their bedside, diagnosing by uroscopy, issuing prescriptions for medicines (fulfilled by apothecaries), and supervising blood-letting (usually carried out by barbers or barber-surgeons). 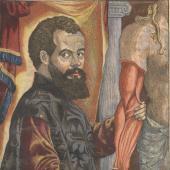 By the middle of the sixteenth century, portraits of physicians began to bear individual likenesses, rather than generic features of the profession. 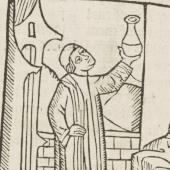 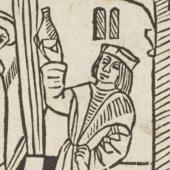 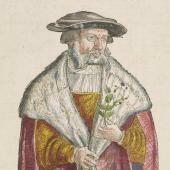 For example, in his commentary on medicinal plants published a year before the Fabrica, Leonhart Fuchs is shown in a full-figure portrait holding a plant, embodying first-hand knowledge or autopsia, promoted by the ancient author on medical plants, Dioscorides. 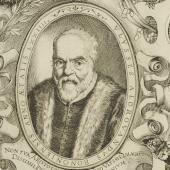 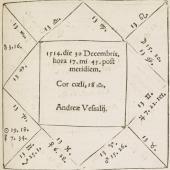 The enduring importance of classical authorities may be further seen in the portrait of Ulisse Aldrovandi and in the frontispiece to Hippocrates’s works.